More than half the nation’s doctors have joined forces to urge policymakers to take make climate change a priority. On Wednesday, more than 434,000 physicians – including family doctors, pediatricians, obstetricians, allergists, geriatricians and internists – launched a campaign to describe how global warming affects health. 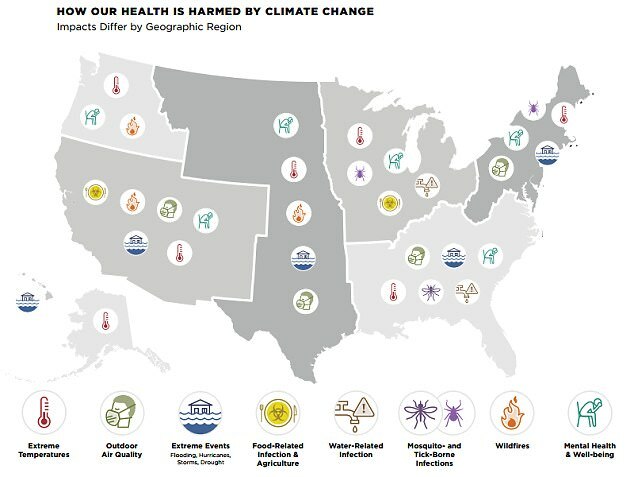 The report includes a map of the United States, detailing the biggest concerns in each region – from rising levels of air pollution to increased water contamination and a widening range for disease-carrying mosquitoes. It also features personal accounts from doctors who have seen the impact of environmental factors first-hand. On Wednesday, 434,000 doctors launched a campaign to describe how global warming affects health in the US. It includes a map of the US showing the biggest issues in each region. The coalition, dubbed the Medical Society Consortium on Climate and Health, consists of doctors from 11 different medical groups. Their aim is to help policy makers understand the health dangers of global warming, and what must be done to guard against it in the coming years. ‘Doctors in every part of our country see that climate change is making Americans sicker,’ said Mona Sarfaty, a physician and director of the new consortium. The report, called Medical Alert! Climate Change Is Harming Our Health, will be circulated to members of the Republican-dominated Congress. Extreme weather, such as hurricanes and droughts, may become more common, destroying not only homes and livelihoods but also wreaking havoc on people’s mental health, it warned. ‘Here’s the message from America’s doctors on climate change: it’s not only happening in the Arctic Circle, it’s happening here,’ said Sarfaty. My nine-year-old son Isaac was attending his last day of band camp when I received a call from the emergency room. He had collapsed in the heat, and was rushed to the emergency room. When my husband arrived at the hospital, Isaac was on a gurney with an IV in his arm, recovering under the watchful eyes of nurses and doctors. It was a terrifying experience for him. That day was part of a record-setting heatwave in Washington, DC, one of several days that summer when the heat index reached over 120 degrees. As a pediatrician, I know that Isaac is not alone in his vulnerability to the heat. Emergency room visits for heat illnesses increased by 133 percent between 1997 and 2006. Almost half of these patients were children and adolescents. In August 2010, another record hot summer, a colleague treated Logan, a young football player, in Arkansas. He showed initial signs of heat illness—weakness and fatigue—during practice in his un-airconditioned gym, but he wasn’t treated right away. He subsequently developed heat stroke, kidney failure and pulmonary edema. Fortunately, kidney dialysis saved him, but it was a close call. Every summer, I see the impacts of increasing temperature and heat waves on children like Logan, and warn parents of the dangers of increasing heat waves. I believe it’s imperative that pediatricians on the frontlines of this urgent problem speak out for children on issues that will harm the health and prosperity of our youngest generations.